The phrase "rapidly approaching" in reference to Armageddon is used in Watchtower Society publications to spur Jehovah's Witnesses to spend more time going door-to-door — even to drop out of high school or secular employment to do so. If Armageddon is truly "rapidly approaching" and only JWs will survive — and any JWs who did not preach sufficiently will also perish — then more hours spent going door-to-door makes sense. Old JWs have heard it hundreds of times and are used to it, but to new ones and young ones "Armageddon rapidly approaching" is a frightening threat. Revelation 16:16 calls it the "war of the great day of God the Almighty," Armageddon. This war will come in the twentieth century. Mostly, however, non-specific but threatening phrases are used such as "rapidly approaching", "very near" and "at the brink". The rapidly approaching battle of Armageddon makes the matter of praising God increasingly urgent for survival. But the end of such things is near, for Jehovah God, the Great Shepherd, is directing a marvelous pastoral work world-wide to gather honest-hearted men to his fold before the rapidly approaching storm of Armageddon strikes. The Deluge did not destroy the earth, it merely rid the earth of its undesirable tenants. So likewise with the rapidly approaching cataclysm of Armageddon; earth's wicked tenants will be destroyed, but it will remain. The battle of Armageddon will take place within this generation… With Armageddon rapidly approaching, it is important that Jehovah's witnesses tell people about Jehovah’s loving provisions for deliverance. With the execution of fiery judgment at the appalling battle of Armageddon rapidly approaching, Jehovah the Great Shepherd feels for these sheeplike ones. Because of all this they will perish at the rapidly approaching battle of Armageddon. Jehovah’s Witnesses believe that the end of the world is rapidly approaching, on the basis of their deductions from Holy Writ. So, whereas we know that we are rapidly approaching the battle of Armageddon, we do not know when it will begin, neither when it will end, and hence how long it will be. Yes, just as human governments today send out urgent storm warnings, so the government of God, his kingdom, by means of its earthly representatives, the Christian witnesses of Jehovah, is sending out urgent warnings regarding the great storm of Armageddon that is rapidly approaching. Now, in 1964, we are living in the fiftieth year of Kingdom rule. The assault of Gog of Magog, Satan the Devil, against all Christians is approaching rapidly. To an unnumbered great crowd of persons from all nations and peoples, he promises to grant survival through a rapidly approaching great tribulation, and then entrance into a new order of his own making. So, then, since the "war of the great day of God the Almighty" at Har-Magedon is now rapidly approaching, let us examine God's use of Jeremiah at that ancient time. Now is when they need to prepare themselves to withstand the pressures that will come against God’s people during the rapidly approaching "great tribulation." The difficult time all faithful Christians are now having is soon to end, for we are rapidly approaching a new, happy era. Even as righteously disposed humans survived the Deluge, however, so Jesus showed that some will survive the rapidly approaching "great tribulation." Shortly after the destruction of false religion, Jesus Christ will use his heavenly army to destroy the rest of this wicked system of things. It will perish in the rapidly approaching "war of the great day of God the Almighty" at Har-Magedon. We are, therefore, rapidly approaching that glorious time when Christ Jesus will fully take over rulership of earth's affairs and unite all obedient mankind under his one government. Those who are upright will soon see the wicked perish from the earth in the rapidly approaching "day of Jehovah's anger." Moreover, the prophecy showed that this work would be done before "the great and fear-inspiring day of Jehovah." That rapidly approaching event includes "the war of the great day of God the Almighty" at Har-Magedon, or Armageddon. Yes, Jesus will serve as God's Executioner during the rapidly approaching "great tribulation." And their devotion to God and his service will be rewarded in their being spared from the eternal destruction about to befall proud, unrepentant sinners in the rapidly approaching "day of Jehovah." God will bring destruction upon all wicked humans. The last of them will draw his final breath in the rapidly approaching "war of the great day of God the Almighty." That deliverance in 1919 and the divine protection they experienced since then have allowed the anointed remnant to do what? To shine forth in giving a final witness before Jehovah brings an end to Satan’s wicked system of things in the rapidly approaching "great tribulation." Malachi's prophecy showed that this great Elijah work would be done before "the great and fear-inspiring day of Jehovah." That day concludes with the rapidly approaching war of the great day of God the Almighty, at Armageddon. We also know that the majority of the 144,000 are already united with Christ. Only a relatively few remain on earth. What a powerful indication that the time for the execution of God's judgment is rapidly approaching! Soon, Satan's entire world system will be destroyed. 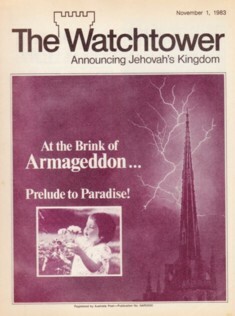 Most JWs who were spurred by "rapidly approaching" Armageddon to distribute Watchtower Society publications in the 1950s and earlier are deceased. Armageddon had not "rapidly approached" after all and they sacrificed education, employment and time in vain. They were misled.